Catholic News World : Saintly Catholic Army Chaplain Father Emil Kapaun was Awarded Medal of Honor and served even as POW - SHARE his Story! Saintly Catholic Army Chaplain Father Emil Kapaun was Awarded Medal of Honor and served even as POW - SHARE his Story! 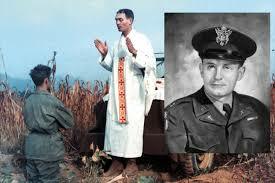 Emil Joseph Kapaun was a Catholic priest and U.S. Army Chaplain born in the small Czech farming community of Pilsen, Kansas, on Holy Thursday, April 20, 1916. Growing up he was much like any other hardworking farm boy, but he was especially mindful of God and others. At first feeling the call to become a missionary priest, under the direction of his local parish priest he decided to enter the seminary for the Diocese of Wichita and was ordained a priest on June 9, 1940. After a few years of service in the Diocese, he answered the call for chaplains during World War II and entered the U.S. Army Chaplain Corps in 1944. After traversing thousands of miles to serve the troops in Burma and India, he returned home from the service in 1946. After two years he re-entered the Army in 1948 and was sent to Japan the following year. In July of 1950 Chaplain Kapaun was among the first troops to be sent to help protect South Korea, which a few weeks earlier had been invaded by the North. It was in Korea that he gained a reputation for his bravery in ministering to the soldiers in the foxholes and in the thick of battle. As Chaplain Kapaun's unit, the 8th Cavalry Regiment of the 1st Cavalry Division, pushed it's way up towards the northern border of North Korea, it was ambushed by the large Chinese Army that was just entering the war. Here, at the Battle of Unsan, on November 2, Kapaun once again traversed all over the ragged battlefield to rescue men or give them Last Rites. He showed his dedication to his "boys" as he chose to remain with a number of wounded men rather than escape. Captured by the enemy, they were forced to march over 60 miles to the prison camp in the bitter cold. Along the way, Father Kapaun carried his wounded comrades and encouraged them to do likewise. In the seven months in prison, Father Kapaun spent himself in heroic service to his fellow prisoners without regard for race, color or creed, giving them help and hope when they needed it most. To this there is testimony of men of all faiths. Ignoring his own ill health, he nursed the sick and wounded, stole food for the hungry, picked lice off of men, washed dirty and soiled clothing, and encouraged men with words and prayers to keep fighting because they would eventually make it out of the camp. Finally a blood clot in his leg and pneumonia prevented his daily rounds. Moved to a so-called hospital, but denied medical assistance, his death soon followed on May 23, 1951. Two years later several hundred Prisoners of War were released, including some that carried with them a beautiful crucifix that was carved by a Jewish POW who was inspired by tales of Father Kapaun's deeds. These Prisoners testified to Father Kapaun's role in their survival and began to tell the world about their heroic chaplain. 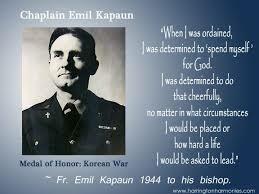 On April 11, 2013, Chaplain Kapaun was awarded the Medal of Honor by President Barack Obama. Only one of 5 chaplains to receive the nation's highest award, he is also the most decorated chaplain in U.S. history. The Church continues to seek honors for Father Kapaun, as the Diocese of Wichita and the Vatican have begun the formal process that could lead to Father Kapaun's Canonization as a saint. In 1993, it was announced that Father Kapaun would receive the title of "Servant of God". In late 2015, the "Positio" on his life and virtues was presented to the Congregation for Saints at the Vatican, which began to review it in 2016. If the Congregation and the Holy Father declare that Kapaun lived with certainty a life of Heroic Virtue, he will be given the title "Venerable", and the door will be opened to review the potential miracle attributed to his intercession needed for his Beatification. After this takes place, another miracle will be required for his Canonization. We hope that you are as inspired by Father Kapaun's life and example as we are, and that you join us in praying for his Beatification and Canonization.